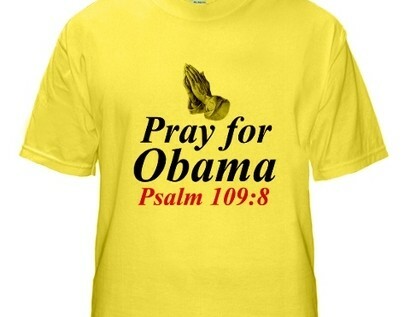 A new Biblical Obama slogan making the rounds on conservative T-shirts and bumper stickers is being interpreted as calling for the president’s death. The psalm goes on to say: “May his children be orphans, and his wife a widow.” Read the entire psalm here. Those with knowledge of the bible say the passage, which is part of a class of psalms called “imprectory” prayers, should not be used at all. One online marketplace site thought the t-shirt was inflamatory enough to ban it from their sales ranks. The Christian Science Monitor asked a few people if the slogan could be considered hate speech. 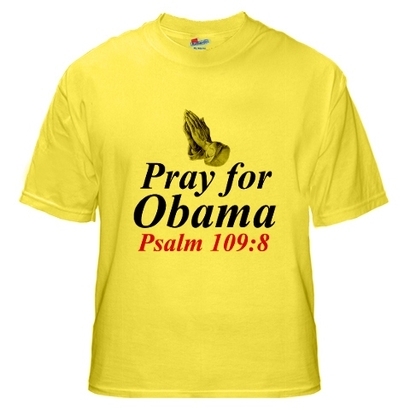 “Are we concerned about real hostility towards [President Obama]? Absolutely,” Deborah Lauter, director of civil rights at the Anti-Defamation League said. “Is this a part of that movement? It may be, but in terms of this message itself, we would not criticize it.